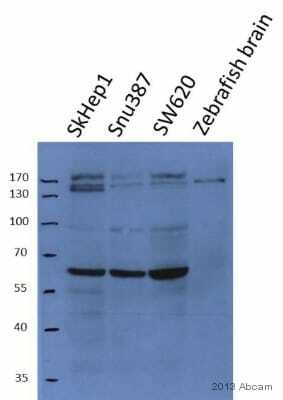 This antibody is expected to recognise isoform NP_000656 only (the ubiquitously expressed, hydrophillic form). Human fibroblast cell lines A431 and HeLa lysates. Human cerebellum lysates. Our Abpromise guarantee covers the use of ab31276 in the following tested applications. WB Use a concentration of 1 - 3 µg/ml. Detects a band of approximately 70 kDa (predicted molecular weight: 68 kDa). Terminates signal transduction at the neuromuscular junction by rapid hydrolysis of the acetylcholine released into the synaptic cleft. Role in neuronal apoptosis. Isoform H is highly expressed in erythrocytes. Belongs to the type-B carboxylesterase/lipase family. Cell membrane; Cell junction > synapse. Secreted. Cell membrane and Nucleus. Only observed in apoptotic nuclei. Anti-Acetylcholinesterase antibody (ab31276) at 1 µg/ml + human cerebellum lysate (35µg protein in RIPA buffer). Observed band size: 70 kDa why is the actual band size different from the predicted? Primary incubation was 1 hour. Publishing research using ab31276? Please let us know so that we can cite the reference in this datasheet. write an abreview. Could you please send a test code? I would be glad if you could help. I hope this information will helpful. Should you have any question please do not hesitate to contact me. Is it possible to help her ? I have been looking for the whole cDNA sequence of Acetylcholinesterase(AChE). In particular, I am looking for the isoform of AChE which is expressed in brain (AChE - isoform T) (ref:http://www.uniprot.org/uniprot/P22303#P22303). Kindly let me know if you can provide with the cDNA sequence for the isoform - T that I mentioned above.Also, if you can, pls. provide me the whole sequnce and let me know the details, the minimum possible amount of sample you could provide and its cost asap. Kindly do the needful at the latest. I'm sorry it is not clear if you are requesting a sample of the antibody, or a sample of the cDNA? Regrettably, we do not sell cDNAsamples. With regards to samples of antibody, I am sorry to confirm that because we carry over 80,000 products, it is unfortunately notfeasible for us to keep small sample sizes of our products. We are happy to reassure our customers that all of our products are covered by our Abpromise, which guarantees that the product will work in the applications and species specified on the datasheet, or we will offer a replacement, credit, or refund within 6 months of purchase. If the product is to be used in an untested species or application, you may be eligible for our testing discount program if the antibody has not yet been purchased. Please contact our Scientific Support team by replying to this email prior to purchase for more information. Otherwise, we like to encourage all of our customers to submit an Abreview via the online product datasheet. We always appreciate customer feedback, whether positive or negative, and we make all product information available to researchers. Plus, each Abreview earns Abpoints that can be used for discounts on future purchases or rewards such as Amazon.com gift certificates. I am sorry we have not been able to provide as much information and help as we would like on this occasion. However, I hope the information is useful. Please do not hesitate to contact us again with any other questions. 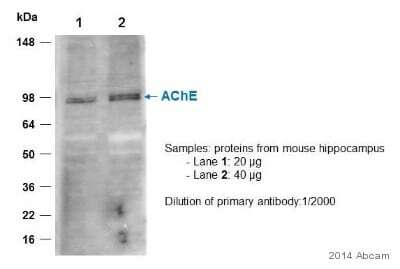 I want to order Acetylcholinesterase antibody (ab31276), as you know, the AchE antibody may be cross-react wtih butyrlcholinesterase. I just wonder if Acetylcholinesterase antibody (ab31276) also cross-react with butyrlcholinesterase. thank you! Thank you for your enquiry. I have enquired at the originator of the product and according to their immunizing peptide sequence blast result, there is no match with butyrylcholinesterase. Therefore, this product should not cross react with butyrlcholinesterase. I hope this information will helpful. If there is anything else that I can help you with, please do not hesitate to contact me.